The Fox Walkers lead Melissa on a blindfolded scent trail, wafting essential oils under her nose to lead her along. Our wonderful intern from Huxley, Skye narrates our puppet show while Melissa pulls the strings and the kids have a snack with full attention onstage! Coony teaches Little Dog to use her "Dog Nose"
The noisy waters we surely rushing over the falls after all of that water this week! Skye checks out a natural mystery with a few boys while Melissa basks in the glory of the sun further down the bridge -- it just feels so nice on these days when the sun shines strong on your skin! 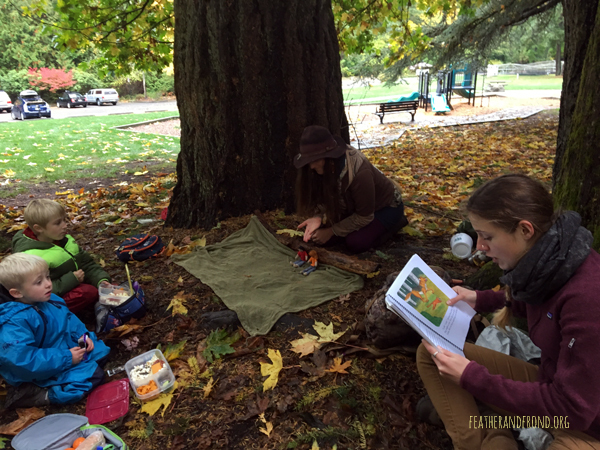 We had an exciting Friday at Whatcom Falls Park last week, which unfortunately included most of the group being bitten and stung by an ornery hive of ground-nesting yellow jackets! The day started off magically enough — after a week full of wet weather, we were finally granted a reprieve. It was a beautiful sunny morning made all the more beautiful by the autumn colors and the water beading off of the moss and leaves. 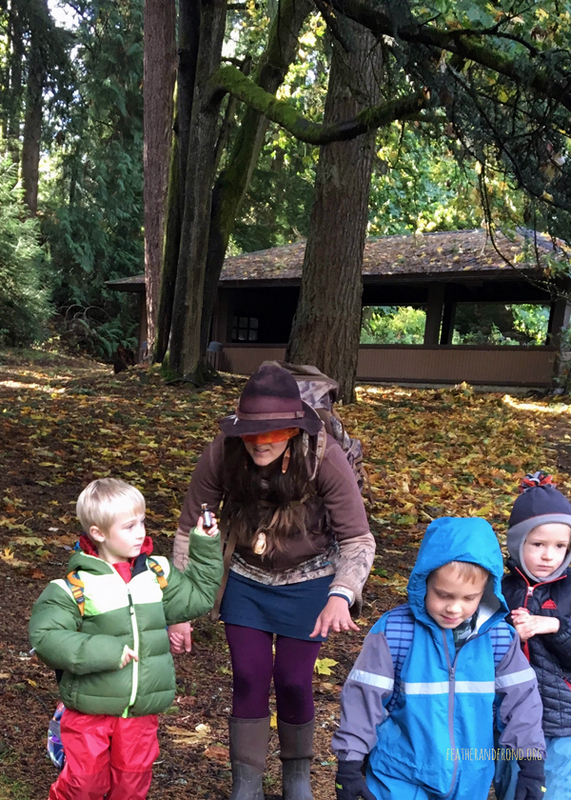 We enjoyed our morning routine which included examining a beautiful Varied Thrush (who likely died during the recent windstorm) and playing an extremely fun game of Fox and Rabbits. Our puppet show/story time had us learning about the adventures of Moon Bird and Running Deer’s cat, Little Dog, and how she learned to hunt. Their dog, Coony, (who we learned last week transforms into a raccoon sometimes to use his “Raccoon Hands”) taught Little Dog how to use her “Dog Nose” to become a fierce hunter. After the story, Melissa put on a blindfold and had the Fox Walkers use some essential oil to lead her on a scent trail. It would seem that we are not the only ones who enjoy that late sunshine, the yellow jackets are still awake as well… I am grateful that no-one has an allergy in the group and also that these are resilient kids who will be back next week smarter and stronger then ever!